One of the best parts about owning a dog is having a companion to take with you on fun adventures. The flip side of that, though, is the cleanup-- after a fun day out, no one wants to spend time toweling off the dog, vacuuming out the car, and scrubbing out any unfortunate accidents that might happen. If you want to save your car (and your sanity) you need to invest in the best dog car seat cover to match your needs. A high quality back seat dog cover or cargo area liner will protect your interior from all of the “extra perks” that come with pet ownership. With so many on the market, it can be overwhelming trying to pick the right one. Stick with us as we walk you through choosing the perfect cover for your needs. Old or new, your car is a large investment and, most likely, a place you spend at least some of your time every day. An investment like that is something you want to protect from your furry family member’s fur, nails and muddiness. 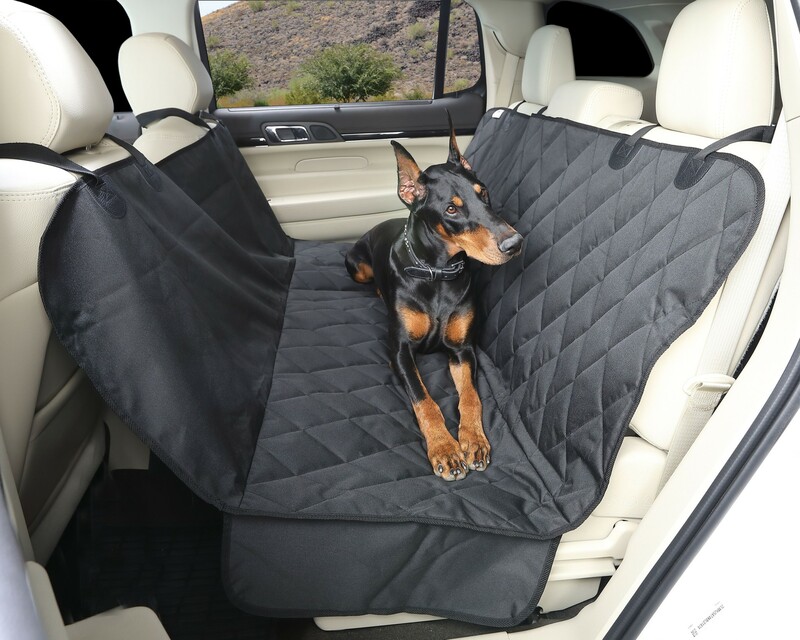 If you’re going to invest in a dog car seat cover, you need to make sure it is durable enough to withstand anything your dog might put it through. This means it needs to be made of high-quality material, waterproof and is easy to clean. Another thing to consider is how easy it is to install and remove. If the car seat cover you choose is difficult to install, you’re adding an extra hassle to what is supposed to be a time saver. Not only that, if it’s difficult to install, it’s more likely to be installed incorrectly which could result in less-than-optimal car seat protection. You also want to make sure it has non-slip backing, like 4Knines car seat covers do. Non-slip backing ensures that your canine family member rides comfortably without sliding around. Not only is this more comfortable for them, but it’s safer too! Speaking of safety… the safest way for your dog to ride in the car is restrained one way or another. There are many different options on the market but no matter which one you choose to use you want to make sure that your car seat cover accommodates your dog’s restraint system. 4Knines Split Rear Cover allows access to all three seat belts which means you can make sure your four-legged loved one is always secure. When you’re picking out your car seat cover there are several styles to choose from, so think about how you are going to be using it and where your dog is most comfortable when riding in the car. Will they be riding in the cargo area? Back seat? Maybe the front or bucket seat? Wherever they are, make sure you get an appropriate style cover. Luckily, 4Knines makes it easy as a one-stop-shop for any type of seat cover you might need. Once you’ve picked out the style of seat cover that best suits your needs, you need to make sure to get one that fits your car properly. To do this, measure your car. When doing so, make sure your car is set up how it will be when you are using the cover (for example, if your dog rides in the cargo area will the rear seats be up or down?). 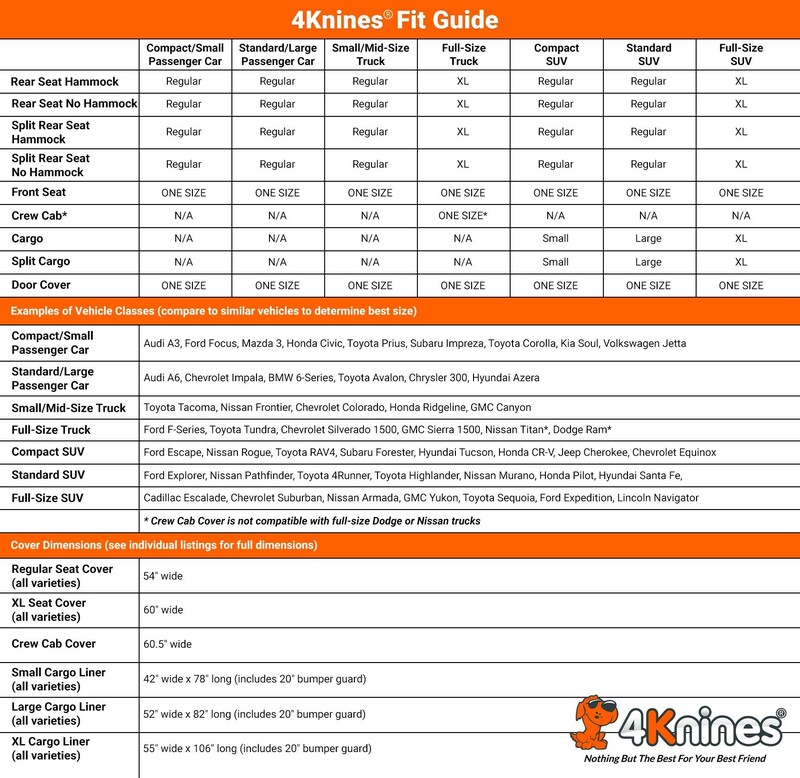 If you’re ordering a rear car seat cover from 4Knines, you can use this handy chart below to make sure you get the perfect fit. And don’t forget… 4Knines products always come with a lifetime satisfaction guarantee, so if you get the wrong size they’ll help you swap it out for something else! While style is perhaps the least important factor, it is still something to consider. If you are spending a significant amount of time in your car, it’s nice to have something that matches your car’s interior and looks high quality. 4Knines car seat covers come in a variety of colors and are built to last, so they won’t start looking run down over time. Still got questions about picking the perfect dog car seat cover? Let us know in the comments below!